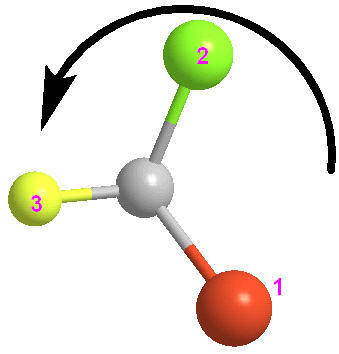 The study of spatial (3-D) arrangement of atoms within molecules. 1) Isomers: different compounds with the same molecular formula. 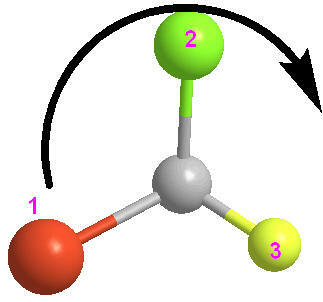 These are but two ways to draw a generic chiral carbon. The drawing on the left, of course, does not indicate any stereochemistry at all- it is a flat drawing, but the central C atom is chiral. However, the drawing with a dashed line & wedge, does depict stereochemistry: the C and groups # 1 & 2 are in the plane of the paper; group #3 comes out of the plane (towards the viewer) and group #4 goes back, away from the viewer. 5) Enantiomers: These are pairs of nonsuperposable, mirror images. Bromochlorofluoromethane is NOT superposable upon its mirror image, and therefore, the two stereoisomers are an enantiomeric pair or enantiomers of each other. EXERCISE: Indicate which Carbon atoms (if any) are chiral in the following structures. The atom, which marks the "first point of difference" is highlighted in pink. Notice that the priority of the groups is analogous to rule #1. 1. Locate the chiral center and identify its four substituents. Remember to look for 4 different groups or atoms attached to a central carbon atom.